Step-up to quality, comfort and craftsmanship with the made in the USA, 52" long, mahogany Maven Classic American Bison Leather Camera Strap with Hook with Pad from HoldFast. 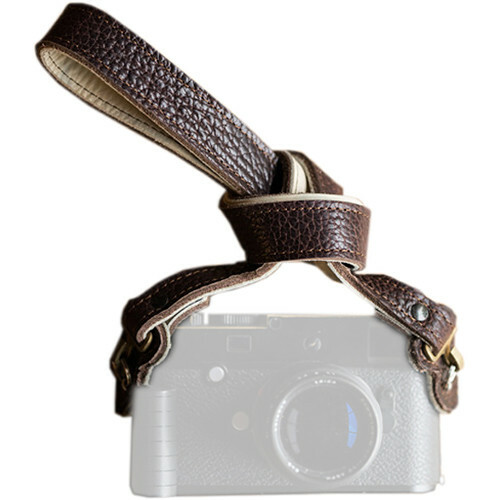 This strap is designed to hold your mirrorless or small DSLR camera with attached lens. Two different connection methods are available. First is HoldFast's custom brass u-hooks with a bison leather pad to provide a quick and easy installation without the risk of scratching your camera. The second type is a universal clip without the protective pad for cameras with a side lug mount. Box Dimensions (LxWxH) 6.8 x 4.7 x 1.0"